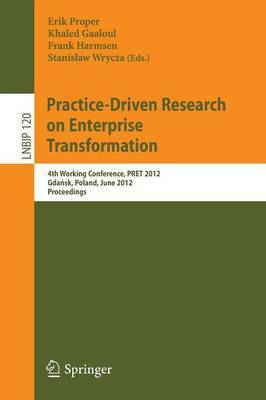 This volume constitutes the proceedings of the 4th Working Conference on Practice-Driven Research on Enterprise Transformation (PRET), held in Gdansk, Poland, on June 27, 2012, as the industrial track of the 24th International Conference on Advanced Information Systems Engineering (CAiSE 2012). Restructuring, divesting, improving performance, and merging are among the usual transformation activities that enterprises conduct to provide answers to the challenging demands put on them. To foster the much-needed debate between researchers and practitioners on these topics, the number of papers accepted for PRET is kept low, providing the authors and the audience with ample time to engage in discussions about both the practical implications of results and the theoretical underpinnings of phenomena observed in industrial practice. This year, five papers were selected after careful review, and each paper is between 20 and 25 pages long, to allow for the presentation of details. The topics covered include enterprise architecture, business and IT alignment, and business process management and evaluation.